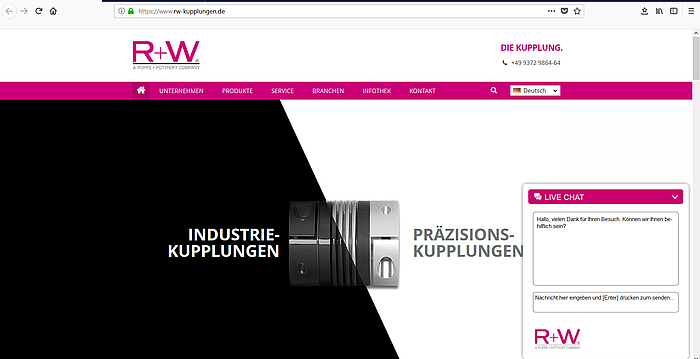 A German manufacturer of couplings with locations worldwide, R+W offers various types of assistance and even a free consultation to enable optimal selection of your coupling. The first step in answering customer needs is to divide couplings into two main categories: precision couplings and industrial couplings. The product worlds and, ultimately, the areas of application for couplings, are visually differentiated using black and white colour coding, which offers a starting point down the right path to the selection of the "correct" coupling. This colour coding is also used to differentiate products on the R+W website. On the website, initial advice is available via the live chat function. The sales department is on-hand during office hours to answer questions on the different types of couplings. If more help is needed, R+W has a technical sales department, which can answer technical questions on coupling design. Customer-specific special solutions can even be developed with the in-house design department in close coordination with system design. If you want to find out more on your own, you can download the free R+W App – for Apple and Google, and now also available in a Windows version or take advantage of the CAD Product configurator with direct configuration function.